As sanctions prove ineffective, information is the key to penetrating the Hermit Kingdom. North Korea (NK) is a lot like Shawshank prison in the film The Shawshank Redemption. Kim Jong-un (KJU) is the warden, the keepers of the regime are the guards, and the people are the inmates who are isolated from the rest of the world, constantly monitored, and stripped of basic rights such as freedom of movement and communication. There are differences of course. For one, KJU is much more powerful than the warden of Shawshank. KJU’s prison is not only heavily fortified and armed with conventional and asymmetric weapons, it could also have nuclear weapons soon. More importantly, unlike typical inmates who count the days to freedom, the majority of North Koreans not only consider NK their home dating back some 4,000 years, but are also indoctrinated and trained to fight for the NK regime against the enemies outside its walls. In fact, most North Koreans would probably not choose to escape NK even if the prison walls came crumbling down. For four millennia, the Korean peninsula was a feudal, stratified society where the ruling class reigned supreme while the majority of the people remained poor, generation after generation. The Korean people however, despite their generations of hardship, conformed under the given conditions and circumstances. In fact, all that the Korean people desired was to effectively mind their own business, isolated from the rest of the world. However, this desire was increasingly disrupted starting in the 19th century by geopolitical factors. Geographically, the Korean peninsula is surrounded by China to the north and the west, Japan to the east, with a long stretch of ocean to the south. Historically, a powerful Chinese dynasty of some sort exercised regional hegemony and heavily influenced the Korean peninsula, while Japan, due to its geographic location, saw Korea as a pathway to gain access into mainland Asia. Accordingly, appeasing or fighting the dominant regional power to the north, or fending off the Japanese invaders from the east, was more often than not the main order of business for the Korean people. This created a deep sense of xenophobia among Koreans. This xenophobia intensified during the late 19th and early 20th centuries as the Korean peninsula turned into an arena of competition among the world powers. The 35-year seizure and occupation of the Korean Peninsula by Japan, immediately followed by the 1945 division of the peninsula initiated by the U.S. and the Soviet Union, exacerbated that xenophobia. The NK regime, since its inception in 1945, has cunningly and ruthlessly utilized the people’s propensity to conform in isolation, regardless of the hardships they faced, as well as their xenophobic attitude toward foreign powers to lock up its people in the world’s largest prison. Here, the people are isolated in a controlled manner, exploited, and brainwashed through the monopolization of information generated and distributed by the regime. However, the walls that isolate the people from the world and allow the regime to oppress them are regarded by the people themselves as necessary defensive mechanisms that protect them from foreign military and ideological invasions. The attitude of the general populace is the result of careful design and thorough conditioning. The NK people, even today, believe that the “American imperialists” started the Korean War in 1950, and that the Americans and their South Korean “puppets” are preparing for one more chance to attack NK, as demonstrated by their annual military exercises in preparation for war. The NK people are sure that, if they were to show weakness, the Americans and South Koreans would attack without hesitation. This perception unites the people behind the regime and allows the regime’s military-first policy to work. Also, as a means to maintain this perception, the cunning keepers of the regime not only vehemently “talk the talk” on going to war (rhetoric such as “sea of fire,” “unimaginable holocaust,” and “the start of a holy war” to name a few) but continue to demonstrate their resolve to “walk the walk” if necessary, by focusing on fortifying the nation and expanding its military capabilities. A consistent policy maintained for over 60 years. The ability to isolate its people and monopolize the information available to them is key to regime survival. This enables the regime to continually condition the people to believe that the “warmongers” in the U.S. and South Korea continue to seek war, which in turn empowers the regime to garner domestic support for its military-first policy and pursuit of nuclear weapons. The South Korean-U.S. Alliance and its military posturing, albeit nominally defensive in nature, are also cunningly exploited by the NK regime to maintain its iron grip over the people. Fear of invasion is a powerful political unifier. The outside world has continuously called for the NK regime to change and become a responsible member of the international community, or face the consequences of falling deeper into isolation coupled with additional sanctions. This is a fundamentally unrealistic and ineffective approach. Isolation is a necessity for regime survival and sanctions have proven to be nonlethal to the regime for the past 60 years. In essence, the international “punishment” of “isolating sanctions” is in fact what the regime seeks. 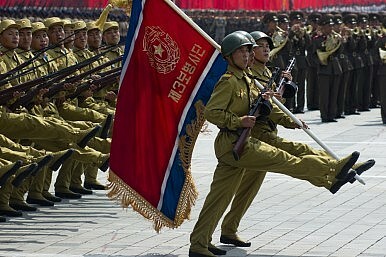 Conversely, the only realistic and effective approach to bringing about change in NK is by enlightening the NK people. To do so, more and more information has to penetrate inside NK. The good news is that censored outside information is slowly but surely seeping into NK. However, the current flow is not enough in terms of quantity, quality, and velocity to inform the NK people so that they can begin the internal dissent required to break out of the feudal cocoon they have lived in. Going back to The Shawshank Redemption, the majority of the NK people are like the character Brooks Hatlen, who conforms to the given conditions and even finds comfort and happiness within the walls of Shawshank prison. However, like the protagonist of the film, Andy Dufresne, North Koreans have in them the courage and spirit to face up to evil and attain freedom, as well as the desire to seek out a better life. Their South Korean brethren achieved this in just 60 years, and so can they. The only thing they need is the opportunity. However, until then, and as long as the prison walls stand without any genuine effort to penetrate them, NK will stick around for quite a while. Jimin Hahm is international relations officer to the commander, United Nations Command/Combined Forces Command/US Forces Korea. The opinions expressed in this article are the author’s own. Washington and its allies need to deal with another potent tool in Pyongyang’s diplomatic arsenal.